Nine parties opposed the CRISPR European patent. This was revoked due to what at first seems to be formalities in the chain of title. This is where North American and European practices clash. As the European patent was opposed in Europe, European practice and standards were applied. According to these, the patent was invalidated. Had the patent been evaluated following North American standards and practice, it might have survived. Everything began with the designation of the applicant(s) and the rights to priority. In short, the CRISPR European patent was invalidated because the priority was found to be invalid: the PCT application did not designate the same applicants as those of the priority cases. inventors A, B, and C, and naming as coapplicants companies X, Y and Z. A year later a PCT application is filed claiming priority on the prior application in the name of X, Y and Z. In this PCT application, once the claims are crystallised for filing, a review finds only inventors A and B have participated in the claimed inventive subject matter. Since their obligations are the same as the year before, only companies X and Y would be named co-applicants on the PCT application. In the example above, at the priority application level, the identity of the inventors would also be looked at. A, B, and C would be named inventors and X, Y and Z would be named co-applicants. For the PCT application, only A and B would be named inventors, but companies X, Y and Z would still be named co-applicants. Inventor A assigned its rights to company X and inventor B assigned its rights to company B. There would then be a need for a further assignment, most likely in favour of company Z to respect the chain of title. However, in the case of institutions, sometimes it may not be easy or even possible to obtain this third assignment in favour of company Z. The problem comes from the interpretation of Article 4 of the Paris Convention, which in a nutshell stipulates that a right to priority is accorded to any person who duly filed a patent application. The European patent office strictly interprets this article, insisting that the applicant(s) in both the priority and the subsequent applications are the same. To prevent possible grounds of attack as seen in the CRISPR case, always sort out the complete chain of title before any filing. When filing a subsequent application claiming priority on a first one, ensure the same applicants are designated and have in place the appropriate assignments signed before filing the application so that it is seen as fully complying with the requirements. 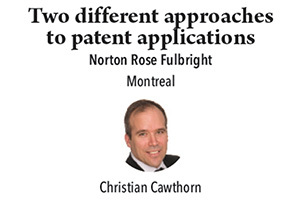 Although inter-institution collaborations are usually easy, sometimes making an institution assign part of its rights to another institution, who, according to North American practice, should have no rights in the claimed invention, might prove difficult. To explain the situation in overly simple terms, this situation might have been prevented had the applications been filed in the name of only one applicant. This case, although much more complicated in practice, might just be the example that will shake institutions into striking a deal before any applications are filed, naming a single applicant.